My skin is sensitive, I just can't switch from one skincare products to another. I felt bad not using up the current skincare products I'm using. The current skincare products work so well on me I just don't have the heart to switch. Anyone of you feels the same? Well, until I got 2 products from the Creme Nirvanesque Range called the Nuxe 1st Wrinkles Smoothing Cream and Eye Contour Cream. It must be the simple and straightforward packaging plus easy-to-read ingredients list that made me go: "Why not give it a shot?" I'm glad I did because these 2 age-defying products are also perfect as make up base! I tote these 2 along with me inside my KIT for clients to use too! Both products are for wrinkle-care! So it's not too early or late to start using anti-aging products girls! A smoothing eye cream that contains peony and hyaluronic acid. At first use, it glides smoothly under the eye area and smoothens dry patches around those areas. I like how it gets absorbed easily without allergic reactions. It was recommended to smooth the product onto skin with "figure-of-eight" movements. I give an extra pressure on key areas below my eye to reduce puffiness too! Added bonus: My concealer glides on smoothly and better with this eye cream. The texture of the smoothing cream is very smooth and creamy. It helps hydrate the skin almost instantly (upon application) and does not sit on the surface of the skin for too long. 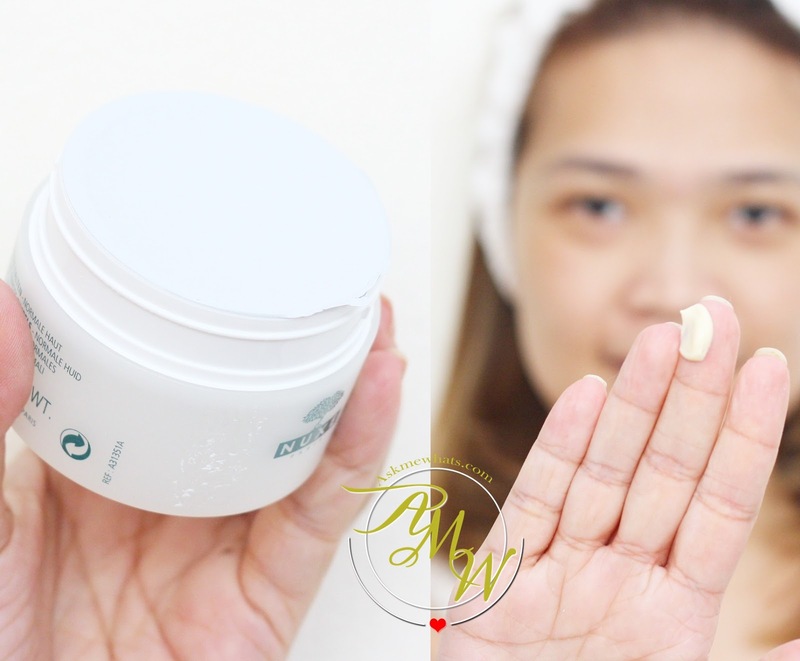 It gets absorbed almost instantly and skin feels smooth and light. I like to gently massage the product at the center of my face gently going outwards and upwards not forgetting the neck. After a week's usage, my skin looks hydrated and radiant. The radiant was gone a bit recently because of cough and colds but I will definitely continue using this until I see better results! Nuxe is exclusively distributed nationwide by Rustan Marketing Corporation. Available in all Rustan's Department Stores and selected Beauty Bar Outlets nationwide. What's your favorite skincare brand that works so well as a make up base too? I do prefer your style of blogging about skin care Ms. Nikki because I know that I can trust your review because you take time in using it and it is in-depth.